I love leaving my newest supplies out in my desk, not only so I can enjoy seeing them a bit longer, but so I have them there to use right away! I recently ordered some new My Mind`s Eye products -- some of the Sweetest Thing collections. The decorative tape is amazing! Beautiful colours and nicely translucent. The patterns are fabulous and not like anything else out there. The enamel dots I love more in person than I thought I would. They were one of my favourite products from the last CHA. And, I stocked up on more chevron patterns... the front side florals in this collection are lovely, but it`s the B-sides that really get me. Polka dots! Chevrons! Love! Addie Blue is an amazing question-asker. She is so observant, critical, thoughtful, and insightful. She comes up with ideas on her own that are quite remarkable. I am always amazed at the kinds of questions she so often asks. This B-side of Bright Meadow paper has a chevron print that is a great brown-grey colour (on the brown side of grey). 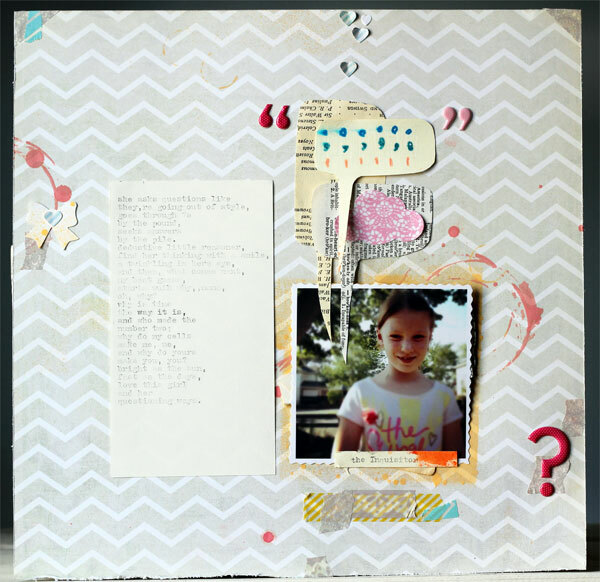 I used a few different My Mind`s Eye decorative tapes on this layout. 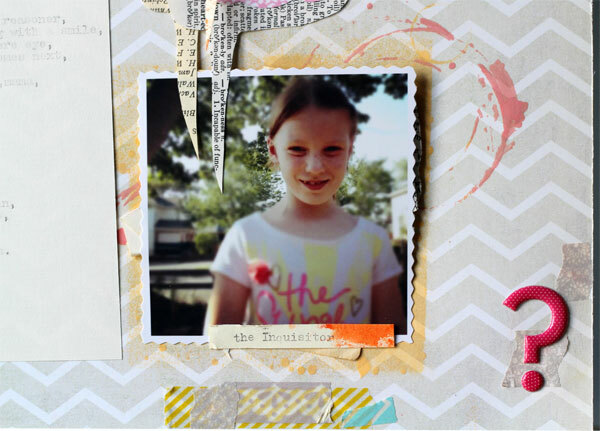 The thinner width grey lace and yellow diagonal stripe are both from the Smile set; the pink lace and blue chevron are from the Reasons Why set; and, the wide grey lace is from the Love set. I finally misted directly on the background of my layout! I have never tried this because I always found my tester pieces to look kind of muddy and blah -- but this layout just needed something, and a fine layer of misting ink seemed like the best idea I had. I masked off a small area behind where I wanted the photo to go, and started misting. It came out unevenly, and a bit splattery, which I really like! I added some pink coffee rings on either side of the photo and one over on the left side of the page. 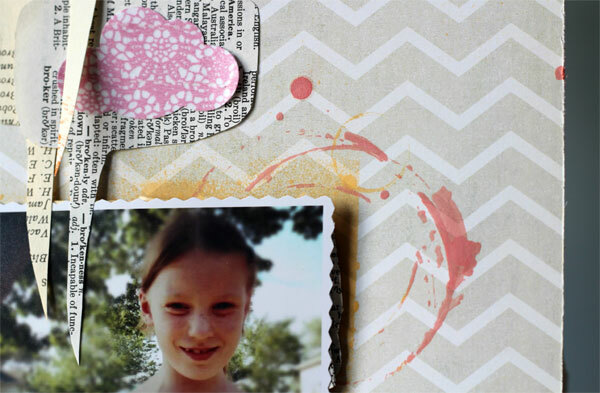 I used October Afternoon Sprinklers from Cakewalk, in Crepe Paper (the yellow behind the photo) and Pink Lemonade (the pink coffee rings). I really love the way these inks settle into the paper, rather than just sitting on top of the paper like paint does. I typed the journalling on my vintage type writer. I freehand cut some speech bubbles from scraps of paper. I put quotations around them -- so happy to finally use some punctuation pieces from a letter sticker set! I covered a piece of cardstock with pink lace decorative tape and punched it out with my Fiskars extra large cloud punch. Here you can see the spongy texture of the yellow mist, and the nice way the OA sprinkler soaked into the paper in the coffee ring. Isn`t that lace cloud adorable? 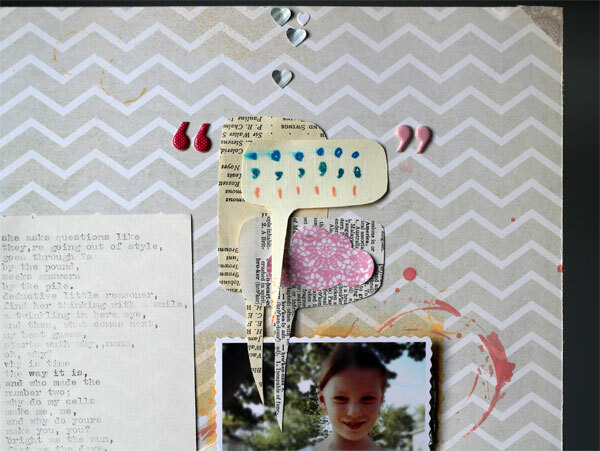 I can see that these new My Mind`s Eye decorative tapes are going to become some of my favourites! Love them already. 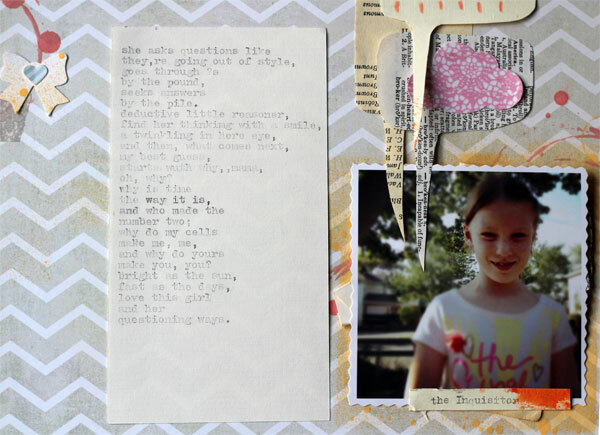 I love the typewriter journaling! I saw an old manual typewriter in an antique store a couple of weeks ago. I'm kicking myself for not buying it.